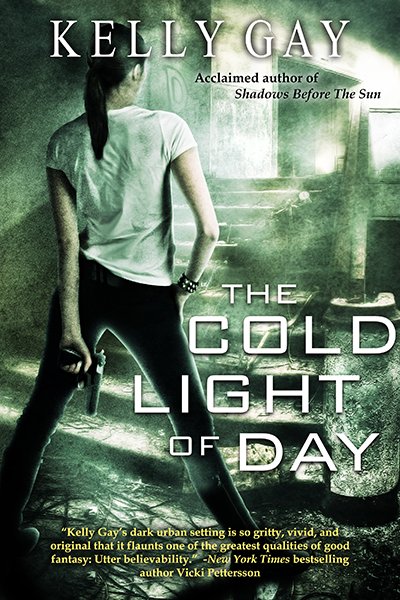 I’m a big fan of Kelly Gay and her dark Charlie Madigan urban fantasy series. The series combined the gritty underbelly of Atlanta with inter-dimensional fantasy, and viola the readers were given an urban fantasy series that bucked most of the urban fantasy tropes and explored new avenues. 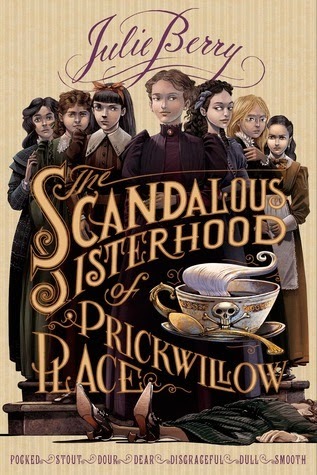 The series was published by an imprint of Simon & Schuster and after four books being published, the series was dropped by the publisher for reasons that weren’t quite sure but were most likely financial ones. The fourth book Shadows Before The Sun was published nearly three years ago and since then we have been waiting to hear about the next book in the series. "Remember the Grimm Brothers? Those dark fairy tales that made you leave the light on long before Disney went and sanitized them? Well, we do! 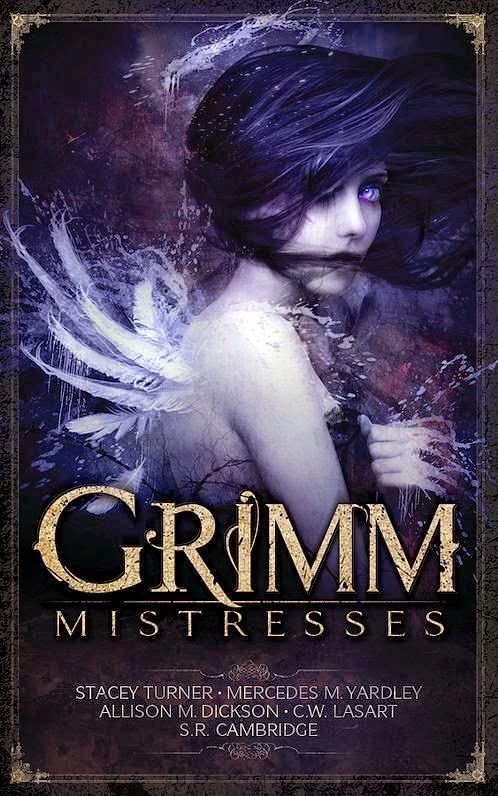 Now the MISTRESSES GRIMM take back the night, five female authors who will leave you shuddering deliciously. Get ready to leave the lights on again with four pieces of short fiction bringing the Grimm Brother’s tales into the present. Be advised: these aren’t your children’s fairy tales!" So get yourself a copy of this dark, enticing collection, I'll be reviewing it in the upcoming weeks as well. We are mightily indebted to Courtney for giving us the golden opportunity to host the cover & blurb reveal of The Labyrinth Of Flame last year. The cover art (seen above) was provided by series regular David Palumbo & the cover design is done by Martha Wade. "Dev's never been a man afraid of a challenge. Not only has he kept his vow to his dead mentor, rescuing a child in the face of impossible odds, but he's freed his mage friend Kiran from both the sadistic master who seeks to enslave him and the foreign Council that wants to kill him." "But Kiran's master Ruslan is planning a brutal revenge, one that will raze an entire country to blood and ashes. Kiran is the key to stopping Ruslan; yet Kiran is dying by inches, victim of the Alathian Council's attempt to chain him. Worse yet, Dev and Kiran have drawn the attention of demons from the darkest of ancient legends. Demons whose power Dev knows is all too real, and that he has every reason to fear." "A fear that grows, as he and Kiran struggle to outmaneuver Ruslan and uncover the secrets locked in Kiran's forgotten childhood. For the demons are playing their own deadly game - and the price of survival may be too terrible to bear." The kickstarter for the book has been live for the past six days and already has been fully funded at four thousand dollars and is currently very close to reaching its first stretch goal. I’m a backer and I’m hoping many of you consider joining in the kickstarter for this tremendous trilogy ending. Zachary Jernigan's No Return was a debut that won me over completely nearly two years ago and now Zachary is releasing the sequel to his complex debut via Nightshade books. 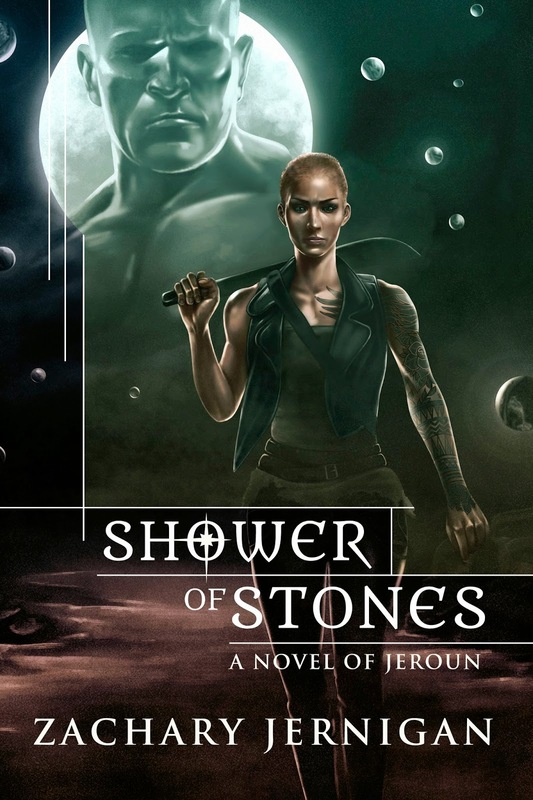 Zack was kind enough to allow us to exclusively reveal the cover for Shower Of Stones which has superb art work by Claudia Noble. Also check out the enticing blurb below thanks to the publisher. The book has a tentative release date of July 7th and I can't wait to immerse myself back into the complex world that is Jeroun. Official Book Blurb — At the moment of his greatest victory, before a crowd of thousands, the warrior Vedas Tezul renounced his faith, calling for revolt against the god Adrash, imploring mankind to unite in this struggle. Good intentions count for nothing. In the three months since his sacrilegious pronouncement, the world has not changed for the better. In fact, it is now on the verge of dying. The Needle hangs broken in orbit above Jeroun, each of its massive iron spheres poised to fall and blanket the planet’s surface in dust. Long-held truces between Adrashi and Anadrashi break apart as panic spreads. With no allegiance to either side, the disgraced soldier Churls walks into the divided city of Danoor with a simple plan: murder the monster named Fesuy Amendja, and retrieve from captivity the only two individuals that still matter to her — Vedas Tezul, and the constructed man Berun. The simple plan goes awry, as simple plans do, and in the process Churls and her companions are introduced to one of the world’s deepest secrets: a madman, insisting he is the link to an ancient world, offering the most tempting lie of all . . . hope. Concluding the visceral, inventive narrative begun in No Return, Shower of Stones pits men against gods and swords against civilization-destroying magic in the fascinatingly harsh world of Jeroun. The book stars the nearly-eponymous Karen Memery. Karen’s a sixteen-year-old bordello girl with an outsize vocabulary, a shaky sense of grammar, and a complete inability to stay out of trouble for more than fifteen minutes at a time. A number of people have asked me why I might want to go and set a steampunk story in the Pacific Northwest. Well, I’m not the first, by any means. Off the top of my head, there’s Cherie Priest’s delightful Boneshaker, for example. And an interesting thing that’s happened in the past few years is a real groundswell of the Weird Western, a subgenre that used to be pretty much staked out by Stephen King and Joe Lansdale—and also was a lot more horror focused. 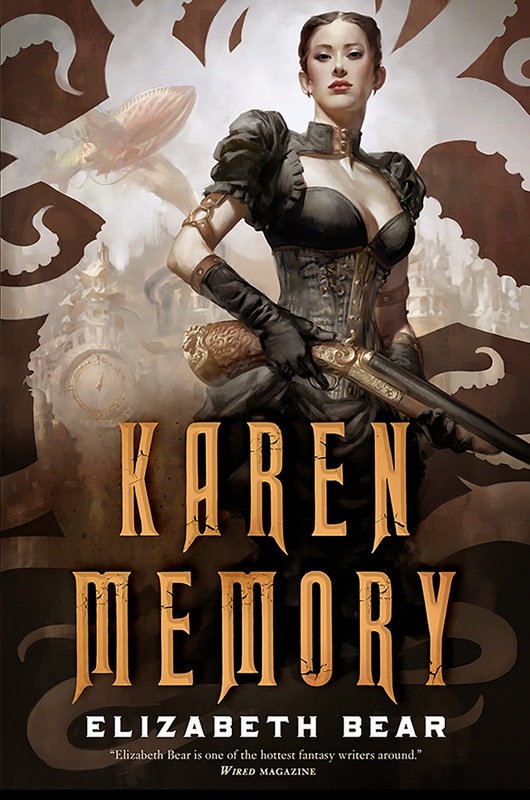 But I started writing Karen Memory in 2009, and the thing I notice is that Emma Bull’s fabulous Western fantasy, Territory, came out a few years before then—and that since, there’s been a steady creep of steampunk elements into Westerns. The TV show and later movie The Wild Wild West is no doubt extremely seminal here, but then we find the blossoming of Cherie’s books, and those of Gemma Files starting with A Book of Tongues, R.S. Belcher’s The Six-Gun Tarot, John Horner Jacob’s The Incorruptibles, Catherynne M. Valente’s Six-Gun Snow White, Tim Pratt’s The Strange Adventures of Rangergirl, Felix Gilman’s The Half-Made-World… well, if you just want a list, Goodreads has a couple! And apparently they’re bringing back Westworld now? Robot gunslingers? Well all right. So, the simple answer is because it’s a fascinating time. Steampunk is often criticized for assuming the trappings of empire without bothering to engage with its colonialism and class issues, but honestly, that doesn’t seem to be the case with most of the Weird West steampunk I’ve read. I know that one of the things that attracted me to the Gold Rush northwest was exactly that—the chance to unfurl a cast of characters that draws some of its interest and conflict from the often whitewashed diversity of the West; the chance to show the perspective of a working-class heroine; the chance to talk about rapacious exploitation. GUEST AUTHOR INFORMATION: Elizabeth Bear was born on the same day as Frodo and Bilbo Baggins, but in a different year. This, coupled with a childhood tendency to read the dictionary for fun, led her inevitably to penury, intransigence, the mispronunciation of common English words, and the writing of speculative fiction. 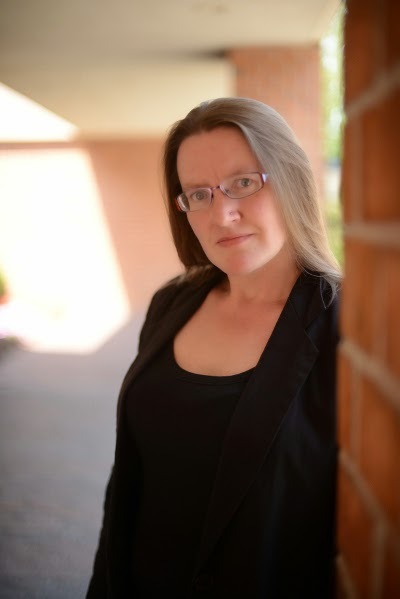 She was the recipient of the John W. Campbell Award for Best New Writer in 2005 and has won two Hugo Awards for her short fiction along with a Sturgeon Award and the Locus Award for Best First Novel.She lives in Massachusetts with a Giant Ridiculous Dog. Her partner, acclaimed fantasy author Scott Lynch, lives in Wisconsin. 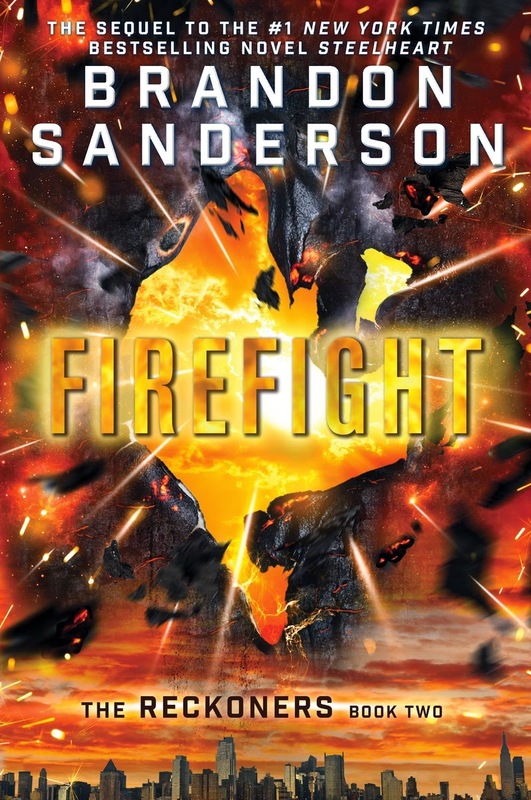 Fantasy Book Critic is excited to provide you with an Epic Reads prize pack to celebrate the release of Firefight by Brandon Sanderson. Firefight was released January 6, 2015. A huge thanks to Random House for providing the prizes for the giveaway. David Charleston still can’t believe it. Steelheart is dead, and he died by David’s own hand. Even the Reckoners had never killed a High Epic, but the invincible has fallen and now Newcago is free. Despite attaining revenge for the murder of his father and living his dream as a team member of the most elite Reckoners cell, David finds he has more questions than ever before, and he won’t find the answers in his home city. Babylon Restored, the city formerly known as Manhattan, could hold the key. Ruled by the mysterious and ambivalent High Epic Regalia, Babylon Restored is a place flooded with water and painted in neon, where the inhabitants spend most of their days lounging and nights partying. David can’t seem to understand the complacency of the city and its residents, but what he does understand is that being positioned here, risky as it may be, could lead him to the answers he so desperately seeks. Because there is an emptiness in him, one left behind after killing Steelheart, that was filled unexpectedly by Firefight, who is just plain Megan to him. And David will stop at nothing to find a way to understand Epics and bring her back to him. Hopefully for good this time. 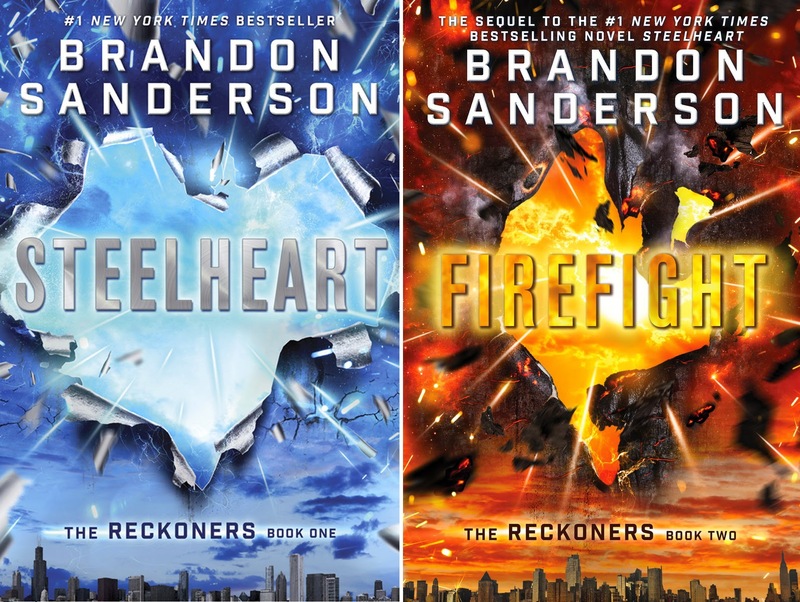 The second book in the Reckoners series and follow up to the highly acclaimed Steelheart, which Publishers Weekly called “an absolute page-turner,” FIREFIGHT is filled with spine-tingling adventure and heart-racing action that promises to satisfy fans both new and old. BRANDON SANDERSON is the author of the internationally bestselling Mistborn trilogy. In 2007, he was chosen to complete Robert Jordan's The Wheel of Time series following the author’s death. 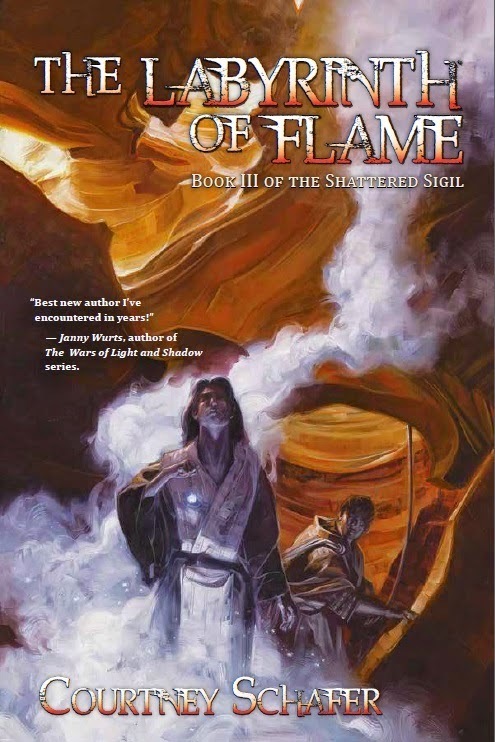 The concluding book in that series, A Memory of Light, was released on January 8, 2013, and debuted at #1 on the New York Times Hardcover Fiction List., just as his two previous Wheel of Time books had done. His work has been published in over 25 languages and his books have sold millions of copies worldwide. He lives and writes in Utah. Visit him at BrandonSanderson.com or connect with him on Twitter @BrandSanderson. This giveaway is open to US addresses only. Giveaway ends February 13, 2015 at 12:01 a.m. EST. To enter send an email with your name and address to fbcgiveaway@gmail.com.